SINGAPORE - Rail operator SMRT has started distributing information packs to homes located along the East-West Line (EWL), as part of its efforts to update commuters of rail renewal projects on the line. Some 295,000 homes are expected to receive the packs, SMRT said in a press release on Tuesday (May 31). Titled "Paving the Way for Better Journeys", each pack contains four collectible fridge magnets meant to commemorate the landmark rail upgrades, and will be sent directly to homes. Multiple projects are taking place at the same time on the EWL as well as the North-South Line (NSL), SMRT said. Both are Singapore's oldest MRT lines - the NSL opened in November 1987, followed by the EWL a month later. The projects include the changing of old wooden sleepers with concrete ones, replacing signalling systems and renewing the third rail, as well as introducing new trains. The sleeper replacement work, in particular, has resulted in speed restrictions at some parts of the line, as the newly-laid concrete sleepers needed time to stabilise on the track bed. Such information explaining why the work is necessary - and how it will benefit commuters - will be in the packs. 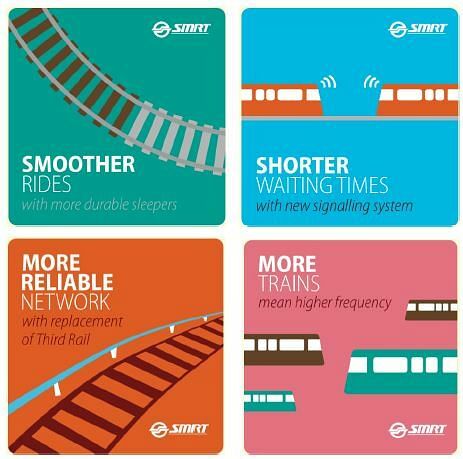 SMRT added that the key benefits for commuters will include smoother rides, shorter waiting times, a more reliable network and more trains. Mr Lee Ling Wee, SMRT Trains' managing director said: "Thanks to the patience and understanding of commuters, we have been able to carry out the renewal and upgrade work along the NSEWL ahead of schedule, even as we continue to keep the network operational every day. "There will be some inconveniences along the way, and this is a meaningful way for us to show our appreciation for their patience and support." 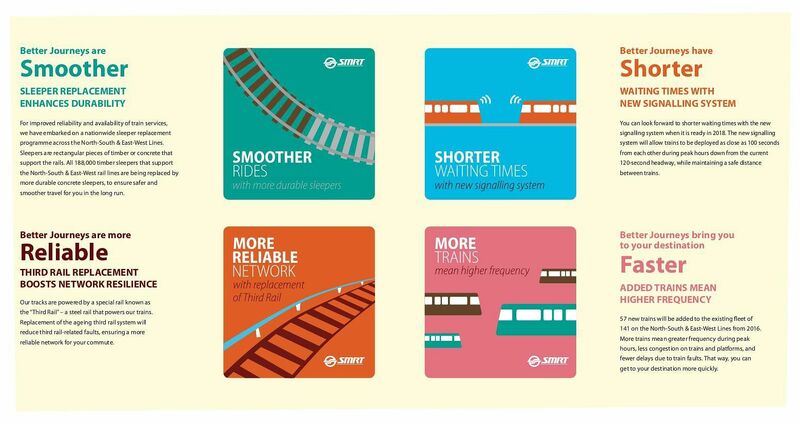 A "Better Journeys" survey will also be conducted, which is accessible via a QR code printed on the pack's pamphlets. Commuters who complete the survey will stand a chance of owning a limited-edition EZ-Link card with a stored value of $20.